"Sheila Margaret Colby, Westbrook College, Class of 1977"
Westbrook College student Sheila Margaret Colby, Class of 1977, was a Nursing major and a Day Hop. 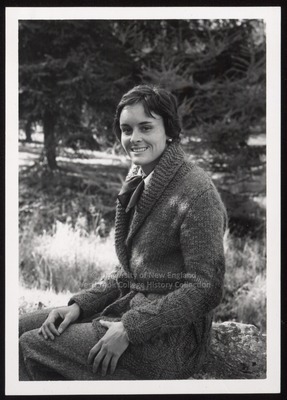 For her senior class candid photo, which appeared in the 1977 Tower Yearbook, she wore wool slacks with a white shirt and scarf tie, and a wool coat-sweater with wide lapels. Her dark hair was cut short in a Shag. Sheila sits beside the Evergreen Cemetery duck pond.